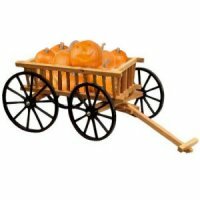 The real country charm of the old timeCorn/Pumpkin Wagon. 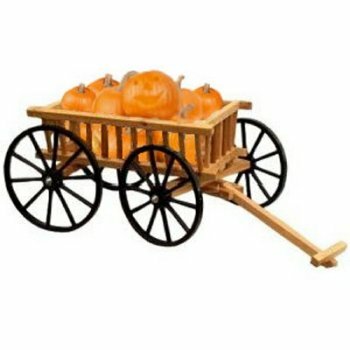 Quality construction and western cedar wood makes for a sturdy wagon that will last for years. 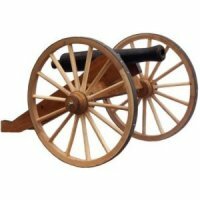 Wheels are made with solid steam-bent hardwood construction and hardwood spokes and have forge shrunk steel rims. 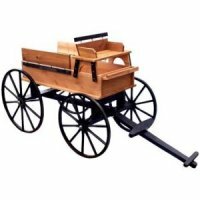 This is not only a functional wagon for light work when used with brass bushing wheel inserts, but it can be used to add that rustic, country, or western decor to any landscape. Use for plants in the spring and summer, use corn, corn stalks, and pumpkins for fall decoration. Ideal for store display and comerical use. Dimensions: Bed size is 18" x 36", front wheels 18" diameter, rear wheels 20" diameter, Minor assembly required.